Cambodie, offeecially the Kinrick o Cambodie is a kintra in Sootheast Asie that borders Thailand tae the wast an northwast, Laos tae the north, Vietnam tae the east, an the Gulf o Thailand tae the sooth. The geography o Cambodie is dominatit bi the Mekong River (Khmer: Tonle Thom (ទន្លេធំ) or "the great river") ana the Tonlé Sap (ទន្លេសាប; "the fresh water lake"). The full offeecial name o the modren kintra is ព្រះរាជាណាចក្រកម្ពុជា (Preăh Réachéa Nachâk Kâmpŭchéa), "Kinrick o Cambodie". 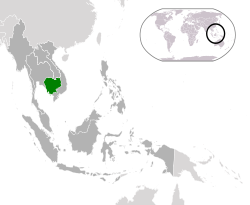 Names uised on general occasions include "Cambodia", "Cambodge", "Kâmpŭchea" an "Srok Khmer", a transliteration o the colloquial Khmer: ស្រុកខ្មែរ which means "the land o Khmers". "Cambodie" is the Scots form o the French "Cambodge" which, in turn, is a transliteration o the Khmer name "Kâmpŭchea" (កម្ពុជា). Wikimedia Commons haes media relatit tae Cambodia. This page wis last eeditit on 15 Februar 2018, at 21:09.